Mary Todd and Abraham Lincoln Look-Alike Contest | Lincoln Days Celebration, Inc.
Greetings, Abraham & Mary Presenters! 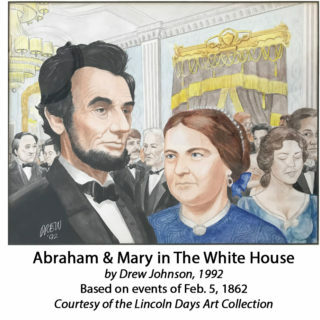 2018 marks the 200th anniversary of Mary Todd Lincoln’s birth, the Bicentennial of the City of Hodgenville, the 175th anniversary of LaRue County, and the 47th annual presentation of this original look-alike event. We are hoping you will join us for the 47th annual Lincoln Days Celebration on October 6-7, 2018 in Hodgenville, KY, birthplace of the 16th President. You’re invited to enjoy the heritage and hospitality of our community. Please see all the complimentary activities listed below. immediately followed by the ladies’ contest. Abraham Lincoln presenters will follow. Pre-registration is greatly appreciated for both events. Late registration will begin at 10 a.m. at the Lincoln Museum Community Room. Links to registration forms are provided on this page. Mary Todd Lincoln participants will be allowed a maximum of 3 minutes to describe their costume and/or to deliver a portrayal of some event in Mary’s life. Participants will be judged on both authenticity of costume and presentation. Abraham Lincoln Look-Alike contestants will be allowed a maximum of 3 minutes to portray/relate a “Lincoln story or speech”. In addition to the short oratory, Abrahams will also be judged on costume, physical traits, and presentation. Look-Alike Activities for Saturday, October 6. 7–9:30 a.m. Complimentary Country Breakfast at the Hodgenville Woman’s Club — for all Lincolns and Mary Todds appearing in costume. 10 a.m.–4:30 p.m. The Lincoln Museum invites all participants to complimentary visits at the Museum — You are also invited to sit and rest, to visit with each other, and to “surprise our visitors” with your presence. Noon–1 p.m. Hospitality Luncheon for Lincoln Presenters at the Hodgenville Woman’s Club. Sponsored by Hodgenville Rotary Club. 1 p.m. Lineup for Lincoln Days Parade — Traditionally, participants have appeared in the Parade, either walking or riding on a float provided by Lincoln Days. The winner of each contest is asked to ride in a special vehicle for the parade. Parade starts at 2 PM. Please register by September 21, 2018 if possible, however, late entries will be accepted. Your hosts for the 2018 Look-Alike Contests are: Hodgenville Rotary Club, Lincoln Days Celebration and The Lincoln Museum. Information: contact Iris LaRue via e-mail or call 270-358-3163. Lodging: Red Lion Inn is offering a reduced rate of $105.99 for Lincoln Presenters.